Stir together 1/2 cup sangria and grape juice. Pour into an ice cube tray and freeze. Pour margarita mixer into an ice cube tray and freeze. 1 hour before serving, rim 2 whiskey glasses with lime juice, sugar and salt. To prepare, blend frozen sangria cubes in a high speed blender with remaining 1/2 cup of sangria. Transfer to a large bowl and place in freezer. Blend frozen margarita mix with tequila and triple sec. Spoon alternating layers of sangria and margarita into prepared glasses. 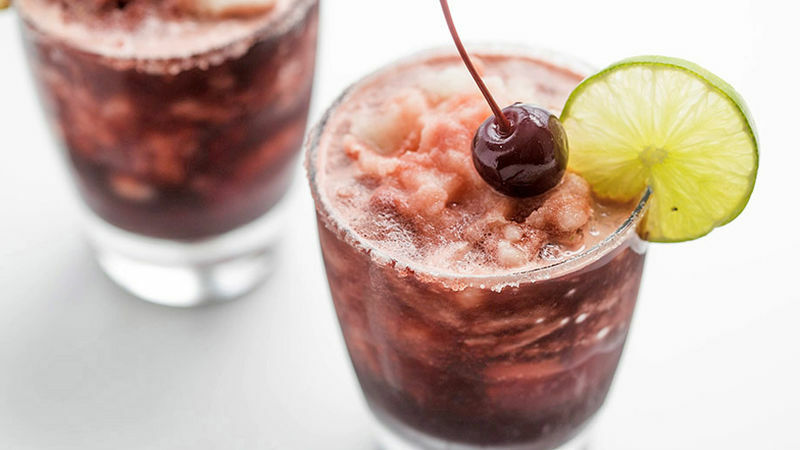 Garnish with lime wedges and a cherry. Enjoy!